Blizzard’s narrative spans multiple platforms. It comes in bits and pieces—a rogue short film at the game’s launch, a digital comic released before a new event. Overwatch’s storytelling is not linear. Weaving across multiple platforms, the game’s timeline bounces between past and present. Blizzard is innovating with its narrative structure, iterating on a storytelling tradition born in the internet era. There is a uniqueness in the way Overwatch’s story is told. Spread across a series of digital shorts, comics, in-game interactions, and an alternate reality game, Overwatch’s history unfolds in pieces, with players flipping cushions and rifling through drawers as if they’re looking for a lost set of keys. In the age of convergence and driven by the internet and connectivity, players are rewarded for spreading their attention across multiple platforms. Overwatch, the game, can stand on its own. Its characters often bear no weight of lore. Heroes who would be considered enemies in the Overwatch world are free to team together and fight would-be allies. Voice lines hint at canon relationships, but are not explicitly considered so—instead, hero personality is “subliminally” imparted into in-game interactions. Media scholar Henry Jenkins calls this approach transmedia storytelling—splaying a story across platforms. An approach to storytelling in this way asks more of a consumer, or player, but the aim is creating a more immersive world. “To fully experience any fictional world, consumers must assume the role of hunters and gatherers, chasing down bits of story across media channels, comparing notes with each other via online discussion groups, and collaborating to ensure that everyone who invests time and effort will come away with a richer entertainment experience,” media scholar Henry Jenkins writes in Convergence Culture. Jenkins points to The Wachowskis’ The Matrix as the pinnacle of transmedia storytelling. Matrix “lore” began spilling out before the film was released: Those interested scoured the web searching, “What is the Matrix?” The three-film series interplayed with each other and a videogame, and it was a lot to keep up with. In fact, it was nearly impossible for one viewer to keep up with it alone: Collaboration is essential in unwinding The Matrix franchises’ tangled threads. There’s simply too many references and secrets for one viewer to “master the franchise,” Jenkins said. 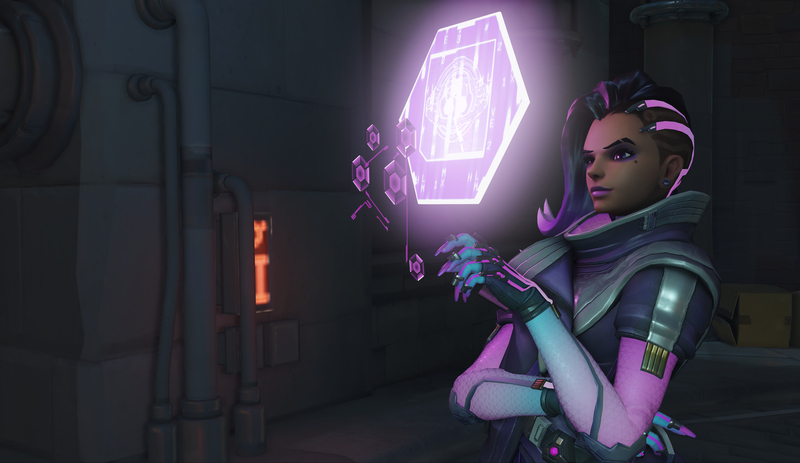 Code continued to be hidden in videos and in Overwatch until Sombra was officially revealed at BlizzCon in November 2016. There, Blizzard released a digital short to explore a mission in which Sombra seeks out the Volskaya Industries CEO Katya Volskaya: A person with serious social and political influence in Overwatch’s Russia. The short film, Infiltration, sees Sombra working for and against bad-guy group Talon—and its payoff, still, has yet to be seen. But because Blizzard, like The Matrix, commands a sense of respect, we trust that the storyline will be continued—or even that it already has, but we’ve yet to find it. There are no limits to transmedia storytelling, thanks to its emphasis on multiplicity—a world built through using a mixed media approach has room for stories to stop and to start again. Opening up this space allows, even, for fan canon to influence and mold “official” canon, blurring the line between the two. Overwatch’s community has latched onto the game’s characters, building out stories and creating their own narratives. Fan-art explores relationships that are—and aren’t—canon, but no other fan theory has more backing than Terry Crews as Doomfist. Initially just a mention in Overwatch’s first digital short, Doomfist forced himself, with the help of Overwatch fans, into the forefront. In December 2016, a YouTube user uploaded a video that paired Brooklyn Nine-nine actor Crews’ voice with an Overwatch character. The community was enraptured. The video reached Crews himself, who offered up his voice for the role. He visited the Blizzard campus and created a video of himself reading voice lines, while Overwatch game director Jeff Kaplan remained coy. In the fan community, Crews as Doomfist is already lore. Blizzard is one of the few arbiters of canon that embrace fan theory and alternative storytelling. 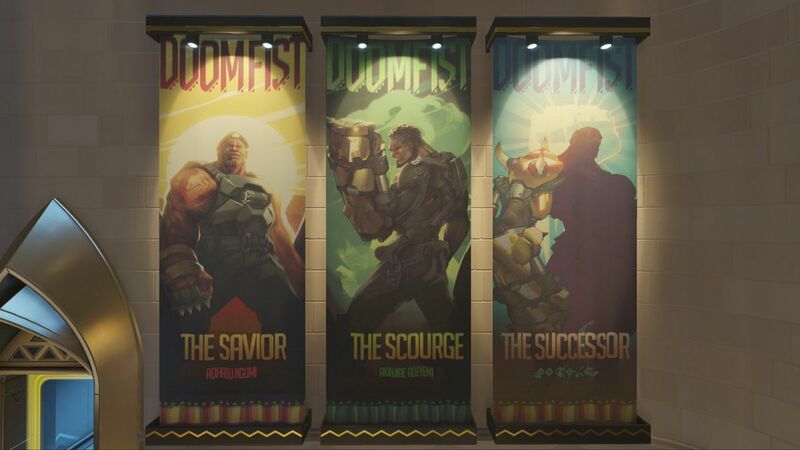 In-game, Doomfist has made vague appearances since the Crews hype train started rolling. On Feb. 24, “Atlas News” reported on a disastrous scene at the Numbani International Airport. Walls crumbling and luggage tossed to the side, the airport was under attack, with all flights in and out of Numbani suspended. Part of Overwatch’s world, Numbani is one of the few locations where robots and humans live as equals. The Omnic Crisis—which is what spurred the creation of Overwatch—fractured omnic and human relationships worldwide. Atlas News is not a real news organization, nor is Numbani a real location. Blizzard released this “news story” to detail push forward the game’s narrative, triggering Orisa’s entrance into Overwatch. Those gripped by the Numbani lore were able to immerse themselves in speculation and theory, while those unaware could just follow along. Nowhere in Blizzard’s releases is there explicit mention that Doomfist, a generational hero in the Overwatch world, attacked the airport, which is how those without prior knowledge of Doomfist could follow along with little help. But for Doomfist fans, all the clues are there: First, Doomfist’s gauntlet was stolen from the Numbani payload. Next, the airport is pictured with an omnic-shaped hole in the hall. And there’s not many things in the Overwatch world that could punch a hole through an airport wall—but Doomfist, a bulky hero with a super strong arm, just might be able to. “Eyewitnesses report sighting of….,” read the ticker at the bottom of the news report. It was intentional to leave that dangling. Those in the know are able to fill that in on their own: Doomfist. It’s not a requirement for Overwatch players to engage with the game’s “extra” content, whether Blizzard-official or fan theory. But it’s for this reason that Jenkins believes The Matrix “fell out of favor” with film critics. Used to reviewing just the film and not its surrounding culture, critics didn’t “get it.” The Matrix required viewers to engage with content across genres, but unlike Overwatch, The Matrix’s “extras” were not exactly free, and a lack of interest doesn’t take away from the game’s core gameplay. There are clear economic motives behind The Matrix’s transmedia storytelling, Jenkins said. Likewise, Blizzard benefits financially from embedding Overwatch completely in a fan’s life, rather than just as a video game. The difference, however, is that besides the main game, Blizzard’s content flow comes without extra cost. Indeed, many enamoured by Overwatch’s lore don’t play the game at all—and that’s perfectly acceptable. Like The Matrix, Overwatch is a “playground,” a space that encourages experimentation and play from both creators and fans alike. Blizzard continues to experiment with the ways it tells a story. Most recently, the developer added a new playable event that rewinds Overwatch. Going back seven years in the future, players are able to play as young versions of four of the game’s heroes—Torbjörn, Reinhardt, Mercy, and Tracer. The Overwatch Uprising event is likely the most formative events for the Overwatch universe. Play of this kind is traditionally how video games tell stories. Overwatch is groundbreaking in that Blizzard initially ignored storytelling of this kind. Playing with the way stories are told in video games pushed Blizzard to be “efficient” in the way it inserts story, Chu said. Overwatch Uprising is a certain result of that. Gameplay in the Overwatch Uprising event is still at the forefront. Storytelling is executed as the mechanics of the game push along, sprinkled in through voice lines. But come May 1—that’s today—Overwatch Uprising ends, once again returning to the books as, simply, history.